As you’d expect them to do. Continuing to protect a voter identification law that courts say discriminates against Hispanics and African Americans, Texas Attorney General Ken Paxton has asked a full federal appeals court to hear his arguments about why the state’s requirements at the polls do not violate the Voting Rights Act. In a series of filings Friday, the Republican asked the full U.S. 5th Circuit Court of Appeals to hear the case, weeks after the court’s three-judge panel ruled that the four-year-old law has a “discriminatory effect” that violates the federal law prohibiting racial discrimination in voting. “Plaintiffs point to no person, and certainly no named plaintiff, whose right to vote will be denied or even substantially burdened by maintaining the status quo” while the legal battle continues, Paxton argued. Paxton also asked the court to keep the law intact for the next election, prolonging a long-winding legal battle that could end up in the U.S. Supreme Court. Earlier this month, a 5th Circuit panel unanimously ruled that the law – Senate Bill 14 – discriminated against minorities and other voters less likely to have certain forms of identification (though it disagreed with a lower court, which had called the law an unconstitutional “poll tax”). For now, the law is still on the books. Plaintiffs, which include minority rights groups and the U.S. Department of Justice, want the case sent back to the lower court, to decide how Texas could fix its law for the next election. In a filing last week, plaintiffs suggested adding voter registration certificates to the list of acceptable ID. “The order could also direct that, consistent with current practice, county registrars should make replacement registration certificates freely and readily available to registered voters who seek them and whose registration certificates are lost or destroyed,” they wrote. See here and here for the background. I can’t say what the full Fifth Circuit Court might do, but this was a unanimous opinion, so it seems likely to not be successful. The main question at this point is can we get a remedy in place for this year, and especially next year? We’ll need action on the former quickly if it’s going to happen. The Chron has more. 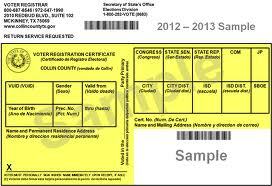 When is Texas going to file that voter ID appeal?